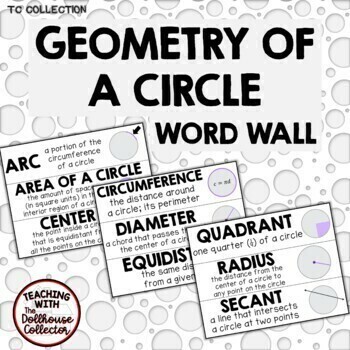 This bundle includes 2 geometry word walls: * GEOMETRY word wall - 38 sentence strips, 8 mini sentence strips, and 4 reference sheets/posters* GEOMETRY OF A CIRCLE word wall - 19 sentence strips Each strip measures approximately 11 in x 2 5/8 in (280 mm x 68 mm), and will fit in most pocket charts. 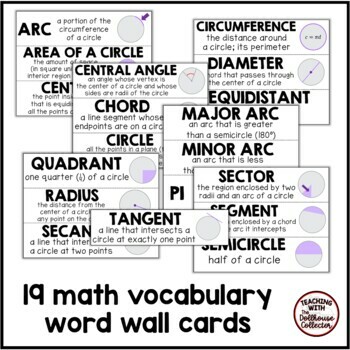 This download includes 19 "sentence strips" for your MATH word wall. Each strip measures approximately 11 in x 2 5/8 in (280 mm x 68 mm), and will fit in most pocket charts. Strips could be laminated or printed on card stock for durability. They could also be shrunk down to fit in students' notebooks, or enlarged as a poster. Each strip displays the name, definition/description, and a visual representation.